Non-medicinal ingredients: dicalcium phosphate, maltodextrin, microcrystalline cellulose, sodium stearyl fumarate. Capsule: hypromellose. The nutrients in Pro Thyroid prevent and reverse thyroid insufficiency including: tyrosine, iodine, and the botanical herbs Coleus forskohlii and Bacopa monnieri..
Tyrosine is a precursor for the important thyroid hormone T3, which affects almost all processes in the body. Iodine is an essential mineral and is also part of T3. Coleus forskohlii and Bacopa monnieri raise the production and release of thyroid hormones. 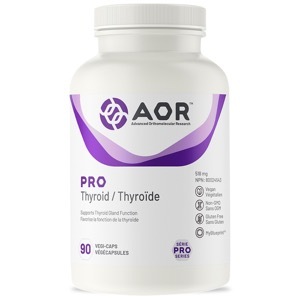 Pro Thyroid contains all of the necessary nutrients for optimal thyroid function. Adult Dosage: Take 1 capsule three times daily with food. Take a few hours before or after taking other medications. Reassess for use beyond 4 weeks. Caution: May cause gastrointestinal disturbances such as epigastric burning sensation and nausea. Discontinue use if rash develops. Caution in those following a low protein diet.